As you can see, if you hover over a Census tract, you can get specific data on its racial/ethnic makeup. A great resource. Although I tried to look up my home town, and even zooming in to the smallest scale, it’s too small to have any data available. According to Corrections Corporation of America reports reviewed by NPR, executives believe immigrant detention is their next big market. 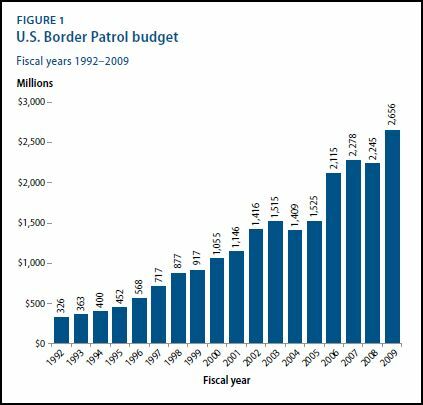 Last year, they wrote that they expect to bring in “a significant portion of our revenues” from Immigration and Customs Enforcement, the agency that detains illegal immigrants. Videos and photos from one recent ALEC conference show banquets, open bar parties and baseball games — all hosted by corporations. Tax records show the group spent $138,000 to keep legislators’ children entertained for the week. But the legislators don’t have to declare these as corporate gifts…legislators can just say they went to ALEC’s conference. They don’t have to declare which corporations sponsored these events. 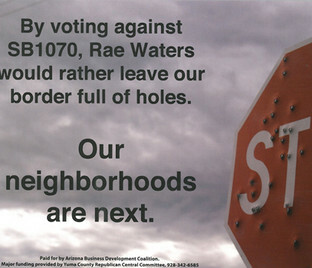 I know that corporations regularly lobby legislators. That in and of itself shouldn’t be surprising — or even inherently problematic if done in a transparent manner. 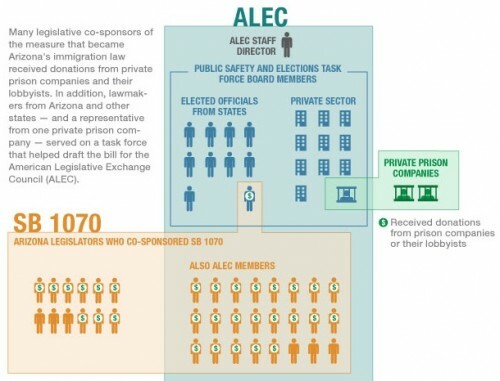 But I have to say, thinking about the fact that private prison industries are actively lobbying to get elected officials to create new categories of crime so they’ll have to lock up more people, and that this connection was ignored for over 6 months after the bill was implemented, struck me as particularly disturbing — as did the fact that once this came out, we haven’t seen any widespread backlash or citizen outcry at the idea that there are companies that directly stand to benefit from putting people in jail helping to write and pass criminal codes. The United States: A Nation of Immigrants? The United States is a nation of immigrants… in that the majority of its citizens are not part of the native population of North America. In other words, because it was and remains a colonized land. 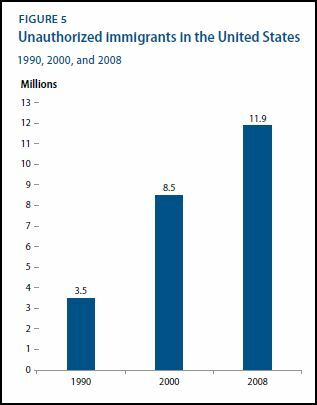 That aside, is the United States unique in receiving an extremely large number of new immigrants relative to its size? It turns out, No. George H.W. 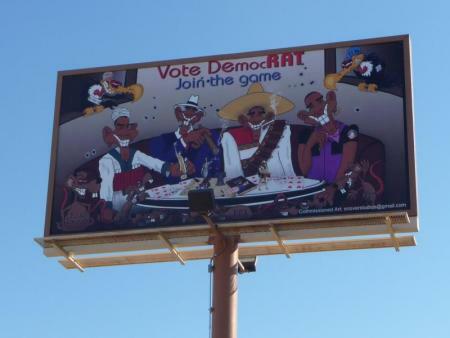 Bush’s 1988 “Willie Horton” campaign ad is infamous for racializing fears of crime, encouraging stereotypes of African American men as violent and threatening. The ad is widely believed to have destroyed Michael Dukakis’s chances for winning the presidency, presenting him as soft on crime. It’s a classic example of race-baiting in political campaigns — ads that present racial/ethnic minorities as threatening. 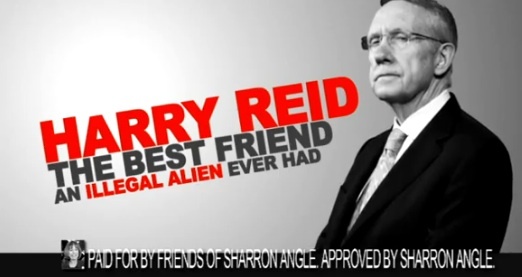 Jesse Helms took a different approach with his affirmative action ad, which draws on some Whites’ fears that they are losing out on jobs because of affirmative action. 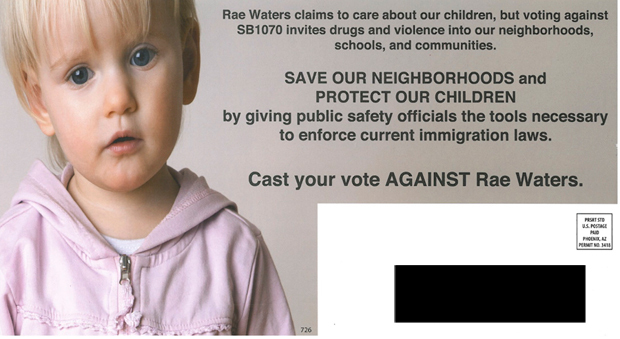 SB 1070 is the controversial Arizona law that allows law enforcement officials to check the immigration status of people they have stopped for other violations if there is a “reasonable suspicion” they might be undocumented or not carrying the appropriate papers. If you have other examples of racialized or anti-immigrant imagery in current campaign ads, let us know. In this video, suggested by Dmitriy T.M., photographer Aaron Huey powerfully illustrates the history of the relationship between the U.S. and the Lakota of the Sioux Nation. It includes the making and breaking of treaties, the use of the idea of private property to strip the Lakota of their land, the Battle of Wounded Knee, the stealing of the Black Hills, and the socio-economic (and related) disadvantages faced by the Lakota today. This 23-minute documentary, The Colony, explores Chinese immigration to Senegal. The immigrants are drawn to Africa by the promise of lucrative entrepreneurship and they are changing the economic landscape, to the pleasure and displeasure of locals. During the 19th the United States received many new residents from China. Sometimes they came voluntarily; sometimes they were imported forcibly. The term “Shanghaied” originally described the forced stealing of Chinese men to come work in America. Many of them worked on the transcontinental railroad, built between 1863 and 1869. Ninety percent of the workers on the central Pacific track, for example, were Chinese. After the railroad was completed, however, many Chinese went to work in industries in which they competed with white American workers, especially mining, and they became scapegoats for white unemployment. For some examples of anti-Asian propaganda, see our collection of “yellow peril” posters and cartoons. 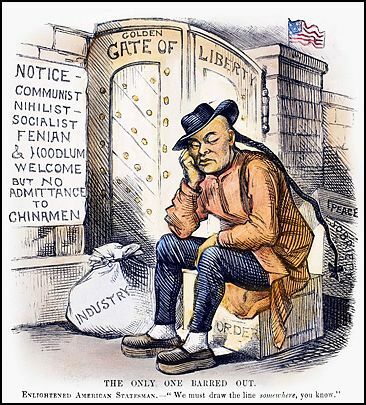 Animosity towards the Chinese culminated in the Chinese Exclusion Act of 1882. The Act meant that Chinese in America, most of whom were adult men, had little hope of reuniting with their families if they stayed in the U.S.; it also allowed the U.S. to deny re-entry if a Chinese person already in the U.S. left the country; and it excluded the Chinese in America from getting U.S. citizenship. A bit of disagreement: The verb to Shanghai someone was more often used with respect to the practice of crimps or other people to use force, intimidation or outright kidnapping to man merchant ships during the 18th century. I’m not about to claim that there weren’t cases of people from Shanghai being forcibly relocated to the US to work on the railroad – but the term refers to one of the abuses of common sailors that was considered usual practice in the age of sail. 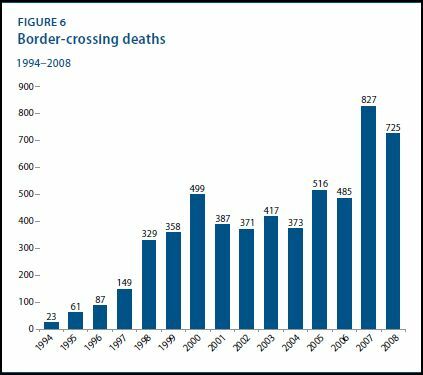 So, the U.S. is spending a lot of money trying to keep undocumented non-citizens out. Is it worth it? 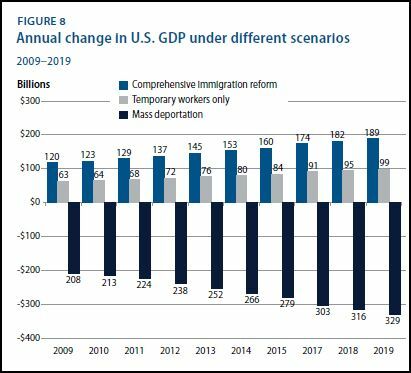 The report also discusses projected changes in the GDP under three different scenarios: immigration reform, allowing temporary workers only, and mass deportation. The figure suggests that undocumented workers are making a substantial contribution to the well-being of the U.S. economy, one that would decrease under conditions of mass deportation. Temporary workers are helpful, but real immigration reform that would bring in greater numbers of permanent and temporary workers is the best thing for America. Hat tip to Graphic Sociology.